Director Matthew Heineman investigates the drug war on the southern border in Cartel Land. 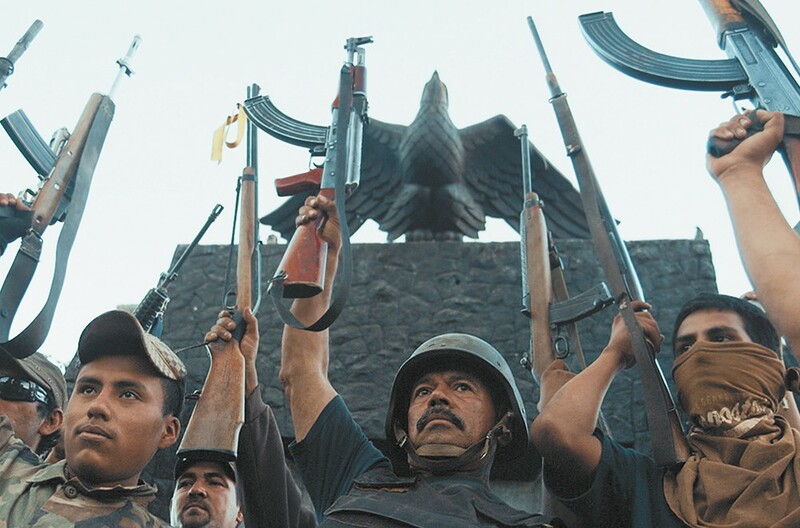 Cartel Land doesn't rely on deep historical research or the filmmaker's interrogation skills to be one of the most intensely watchable and shocking documentaries in recent memory. Instead, its effectiveness comes through the incredible access director Matthew Heineman gained to two vigilante groups — one on each side of the U.S.-Mexico border, both formed by fear of the havoc being wrought by Mexican drug cartels. There's not a lot of "how did we get here?" rumination in Cartel Land, although in telling the stories of vigilante leaders Jose Mireles in Michoacán and Tim "Nailer" Foley in Arizona, we learn that their personal motivations are adequate stand-ins for the frustrations felt by many terrorized civilians in both countries. Heineman jumps right in by putting the audience in the midst of a midnight meth-cooking session in the desert, where the cooks brag about having the "most quantity and best quality." They acknowledge the harm their product does while saying God put them in this business, and "as long as He allows it, we are going to make drugs." The gut-wrenching scenes that follow — a family burying 13 of its members killed by cartel henchmen, bodies hanging from highway overpasses — make it easy to understand why Mireles began a civilian group to fight the cartels destroying the communities in his region. He's a friendly doctor by day, but in his role leading the Autodefensa, you see how far a seemingly good man can be pushed by extreme circumstances when he orders one of his men, after kidnapping a cartel soldier, to "find out what you can, then put him in the ground." The rationale behind Foley's group of self-appointed, heavily armed border guards is more problematic. The drugs crossing the border are a problem, and the U.S. government might lack the wherewithal to do anything about it, but while the Mexican vigilantes rallied after violence in their front yards, the American group seems to be reacting to perceived threats more than real ones. That makes the parts of the film focused on the American vigilantes far less compelling; men roaming a vast, empty desert just aren't as interesting as the gun battles and political intrigue at every turn in Mireles' town. Even so, Heineman effectively shows how the devastation of the cartels and the corruption that allows them to thrive has decimated people, both physically and psychologically. Cartel Land is not showing in any theaters in the area.